Dekenkist is set in Geesteren. Guests have a private terrace. The holiday home features 2 bedrooms, a TV, an equipped kitchen, and 1 bathroom with a shower. Deventer is 25 mi from the holiday home, while Enschede is 18 mi from the property. When would you like to stay at Dekenkist? This holiday home has a washing machine, DVD player and tumble dryer. This holiday home is located in the province of Gelderland, town Geesteren in the region called Achterhoek. 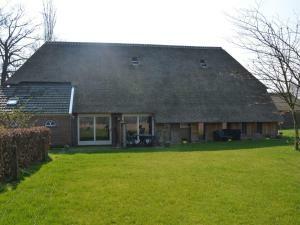 The barn with thatched roof has been converted into a holiday accommodation with cozy apartments, where the details of the old barn are conserved. Think of the original stable windows, a cold aisle and wooden trusses. It has a separate dining and lounge area features a kitchen with all modern conveniences. In addition to a double bedroom there is also a box bed for 2 people, which can be closed by a curtain. From the holiday home you have access to a private terrace where you can enjoy the unobstructed view and fresh air. Geesteren is located in a beautiful landscape. Delicious For nature lovers there are also numerous hiking and biking trails nearby. A visit to the historic city Lochem is definitely worth it. Cities like Almelo, Hengelo, Enschede and Apeldoorn are an easily accessible from the holiday home for a city trip. This holiday home is located next to holiday home 'Kabinet' & 'Broodkast' and located on a meat calves company. Note: Dogs are only allowed as pets. House Rules Dekenkist takes special requests – add in the next step! Dekenkist accepts these cards and reserves the right to temporarily hold an amount prior to arrival. We need at least 5 reviews before we can calculate a review score. If you book and review your stay, you can help Dekenkist meet this goal.